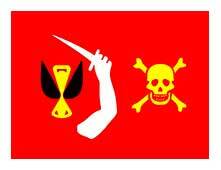 Jolly Roger called the various flag symbols that pirates used to use to frighten their opponents and identify themselves with. The most famous and traditional, is the one with skull-and-crossbones design. The Jolly Roger symbol on black background symbolized to frighten his opponents to surrender. A red background however, meant that the crew was prepared to fight to the death. Sometimes there were also yellow stripes in the design or characters and other symbols. For example, an hourglass, which was a common symbol representing death occurring at the time. The first description of the skull-and-crossbones design used by pirates is found in a logbook from 1687. It tells how the pirates using the flag but not at sea, but on land. 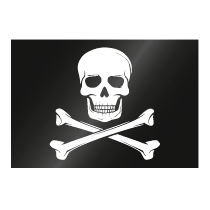 The Jolly Roger symbol was widely used among pirates during the 1700s and 1800s. And even today it is used as a symbol by various groups; sports teams, musical groups, etc. Further importance and use of the skull-and-crossbones design is for example, to indicate a danger that poison.